Picardy has for centuries been at the centre of Europe, fought over by the Great Powers from the Battle of Crecy in 1346 during the Hundred Years War to the Battle of the Somme in 1916. The region’s rich farmlands have always brought prosperity as well as conflict and this is reflected in its heritage of Gothic art and architecture, including its six splendid cathedrals, the most impressive of which is perhaps the UNESCO World Heritage listed cathedral church at Amiens. The battlefields of the Great War have left their mark on the landscape with memorials, cemeteries, museums and preserved features such as trench complexes and craters. Peaceful now, they offer a fascinating and moving insight into Europe’s troubled past. We cruise the region from North to South along the Canal du Nord, crossing the pastoral Fields of Flanders, the ancient city of Lille, founded on its cloth trade and on through the nearby battlefields of Arras, Vimy Ridge and the Somme. Some of the action actually took place on the banks of the canal and we can still see the evidence as we sail by or walk the towpaths. Further south the châteaux of Chantilly and Compiègne nestle in a large forest that once extended all the way from Paris and it is near Compiègne itself that the World War I Armistice was famously signed in a railway carriage, sited in a forest clearing. 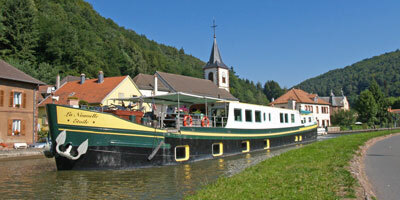 The 12 passenger Panache and the ultra-deluxe 8 passenger La Nouvelle Etoile cruise through this fascinating region, between Belgium and Paris, in late Spring each year.